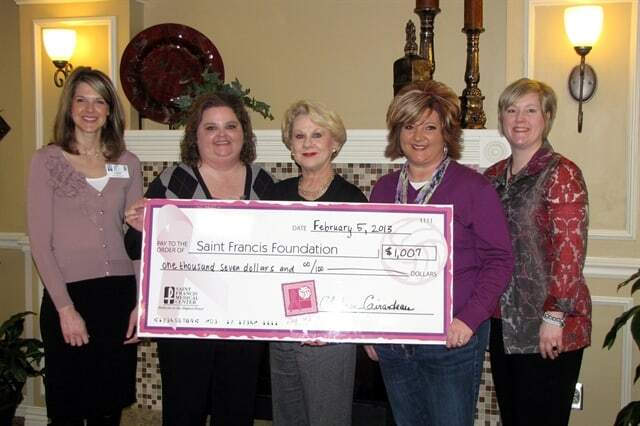 Employees at Chateau Girardeau raised $1,557 for Dig for Life, Saint Francis Medical Center’s program that provides free mammography screenings for women who otherwise could not afford them. The donation was funded by employee’s Pink Up efforts throughout the month of October. Staff participated in bake sales and T-shirt sales, as well as paid dress-down days, to raise money during Breast Cancer Awareness month. Through Dig for Life donors, Saint Francis provides more than 400 free mammograms to local women each year, and has provided more than 2,000 free mammograms since the program began in 2000. Breast cancer is the second-most diagnosed – and second-most fatal – cancer in women. One in eight women will be diagnosed with the disease in her lifetime, but early detection could save her life. Women age 40 and older should have a yearly screening, although only 51 percent get an annual mammogram. Events supporting Dig for Life are scheduled in October and throughout the year and are listed atwww.digforlife.com. Please visit the website or call 573-331-5133 to learn more or donate to the cause.